We had a fabulous favorite paint color party and I was thinking...how fun would it be to have our own little favorite things party? 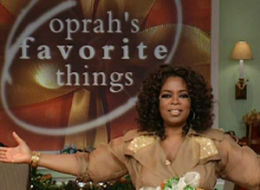 You know the Oprah show I'm talking about...where she shares her favorite things from the past year that cost millions of dollars and everyone in the audience gets one and you immediately hate that you're not there and begin googling how to get a ticket for next year. You can share a list of 5-10 of your favorite finds that you would send to your best friends if you could~anything from your favorite lip gloss, chocolate, magazine, cd, home item, blog post, gadget, candle, electronic device, peanut butter, book, jewelry, item from an etsy store, socks, makeup remover, cleaning product...anything as long as it's your favorite, you've personally tried it, you're not trying to make money on it, and no one is paying you to talk about it. feel free to grab a button above and invite anyone. I hope you have a great weekend~oh, and if you haven't read this, it's so worth it. Exciting! And a wonderful idea! Oh, good!! I'll look forward to that party. How are you doing? How's the house-showing going? Bless you! So much fun!!! Every month or so I send my sister-in-law a package with some of my favorite things, she live alone in another state and she loves the packages! This is such a good idea. Count me in. I can't wait to see what others have posted as their favorites. Not having Oprah's income, it is nice to see affordable favorites that I can obtain and love. This sounds like TOO much fun! I will have to work up a list. Hmmmmmmm. FUN! Great idea, Melissa. :) I'd love to do this party...will you be posting a reminder before the 19th? Sounds like an awesome party, Melissa! Can't wait. Sounds like fun and I JUST wrote this post yesterday so I guess I'm all set :). Sounds so fun - count me in! This favorite things idea is perfect! I love stuff like this. Well, bless my soul, I've just found you, sugar!!! Your dining area looks surprisingly like a friend of ours in Utah and it brought back memories of visiting with them. What a darling blog, my little chick. I'm so glad I happened upon it from Google Reader recommendations. I think I'm going to have to join "th' party" and post my favorite thing/things. Now, that could take a considerable amount of time though. Hmmmmmm, now what will I list??? Who knows, but I think you'll get a giggle if you drop by for a visit. I'm always posting "random thought"!!! This sounds like great fun! I'll be there if i can figure out when the 19th is. Mommy brain.